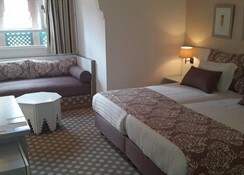 Located in the Hivernage area in Marrakesh, Hotel Les Idrissides offers spacious rooms that come with balconies or patios. 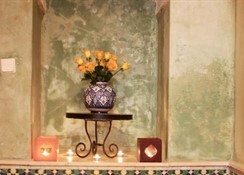 The hotel features traditional Moroccan architecture in all of its spaces. With two splendid swimming pools, an amazing spa, and an aqua park, this hotel is perfect to have a relaxing vacation in the balmy city of Marrakesh. The 310 rooms are set around a central open patio and offer magnificent views of the pool. 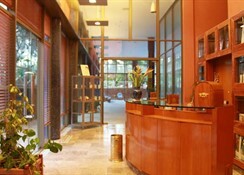 Amenities in the rooms include a minibar, flat-screen TV with satellite channels, and a safe. The hotel boasts of two tennis courts, an omnisport court for volleyball and basketball, French Petanque, table tennis, a state of the art gym and an inviting Jacuzzi. There are three onsite restaurants serving delicious cuisines from around the world as well as scrumptious local delicacies. 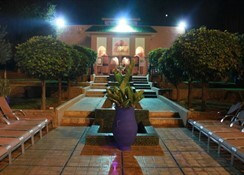 Hotel Les Idrissides is located in the posh Hivernage area in Marrakesh. The hotel is 3.2km from the Menara Airport. The Agdal Gardens are about 7km from here, while the Majorelle Gardens are only 4km. 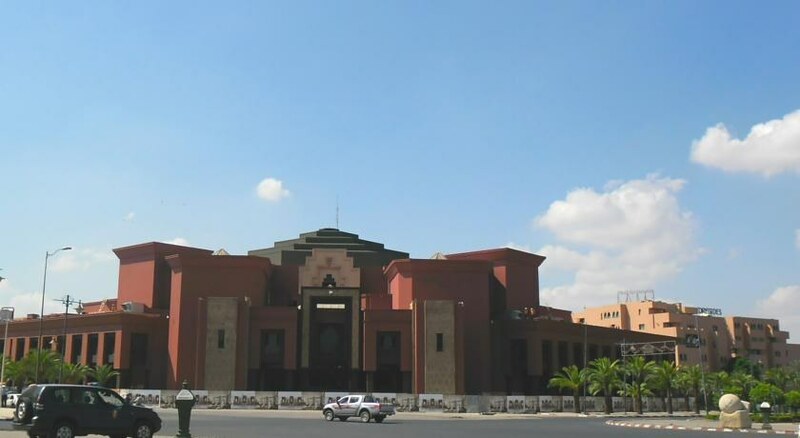 The Marrakesh Train Station is about 800m from the property, enabling you to explore Marrakesh at your convenience. The 310 guestrooms in the hotel are comforting and come in various categories – family rooms, double rooms, twin rooms, deluxe suites and royal suite. Guests can book rooms with or without balconies or patios. The rooms come with air-conditioning, a minibar, flat-screen TV with satellite channels, a safe, en-suite bathrooms with a bathtub, hairdryer and toiletries. For guests travelling as families, extra cribs for babies are provided free of charge. However, babysitting is chargeable. 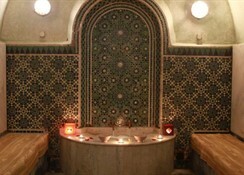 Hotel Les Idrissides features three amazing restaurants serving delicious cuisines from around the world. The hotel’s main restaurant Al Boustane serves breakfast from 6:30am to 10:30am; lunch from 12:30pm to 2:30pm; dinner from 7:30pm to 9:30pm. All meals here are served in buffet style. The other two restaurants serve meals al a carte. Majorelle is an Italian restaurant open only for dinner on select days of the week. Similarly, Zerhoun – an a la carte Moroccan restaurant is open for dinner on select days in a week. There’s also a snack and BBQ grill that the hotel features, which is open from 12:30pm to 2:30pm. The three bars in the hotel, serve a variety of alcoholic beverages and delicious cocktails. 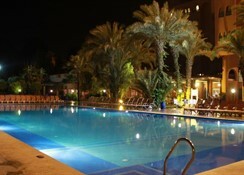 The Hotel Les Idrissides has a plethora of sporting activities including water-sports at the aqua park, water polo at the pool, aerobics, table tennis, basketball, darts, etc. The state of the art gym helps guests to stay in shape even on the vacations. The spa here offers Balneotherapy massages. The animation and entertainment team of the hotel ensures that there isn’t a dull moment during evenings. Karaoke, cabaret shows and disco nights are conducted on select days during the week. There is a kid’s club where your little ones can enjoy. The clay tennis court lets you play a few sets and feel like a Roland Garros champ! Hotel staff were friendly and helpful, food was nice but could do with changing the menu rather than having same food everyday.